The India Post Payments Bank (IPPB) has recently started its banking operations in the country. One can make cash transactions, money transfer,cashless shopping using this card. One may avail various banking services such as opening of savings and current accounts, transfer of money, direct benefit transfers (DBT), bill and utility payments, and so on. 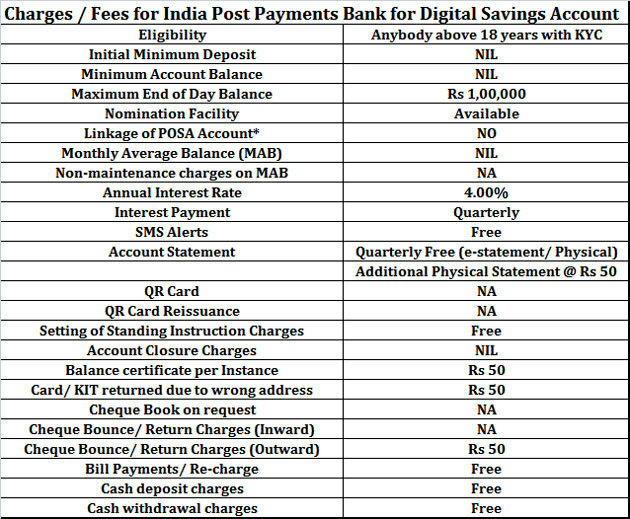 Here, we look at the three different kinds of IPPB savings accounts - regular, digital and basic saving account. 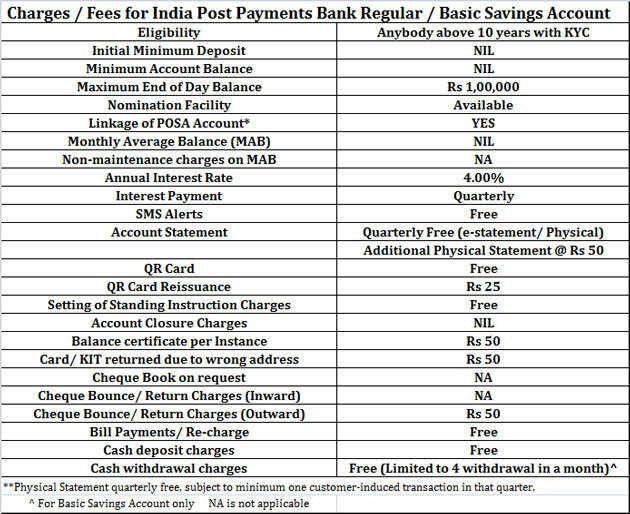 Minimum balance: The account can be opened with zero balance unlike a post office savings account that requires minimum of Rs 20. Further, there is no requirement to maintain a monthly average balance in the account. Anybody above 10 years with KYC can open this account. One can make unlimited cash deposits and withdrawals in this account. 1. QR card: The account does not come with a debit card or cheque book (only the current account has the cheque book facility) to avail various financial services, and instead a QR card is provided. It provides a unique, secure and convenient way to access your account without the hassle of remembering your account number. One need not remember one's password, as transactions can be initiated by using biometric authentication. The place where you want to use this card would have to be equipped with scanning machine for financial transactions and also a biometric authentication device-fingerprint reader or Iris scanner to enable the transaction. You can make cash transactions, money transfer, bill payments, or cashless shopping using this card. In case of a lost or stolen QR card, the money will still be safe in one's account as each transaction is authenticated through biometrics. Using the QR card one can complete the transaction in two steps - scan the code (of the merchant) and authenticate through biometric verification. 2. Maximum balance: The maximum end-of-day balance in the account cannot exceed Rs 1 lakh. This account, however, can be linked to your post office savings account and then the day end balance above Rs. 1 lakh can be swept into the linked post office savings account. The latter will, however, has its own upper limit. 3. Doorstep banking: Gramin Dak Sevak (GDS) or the postman will be there to fulfil the doorstep banking of IPPB. One may ask for doorstep banking (non-cash as well as cash transactions) at their doorstep. At no cost, one may ask for the opening of the account at the doorstep. Once opened, one may even ask for these - transfer funds, deposit and withdraw cash, recharge or pay bills through the doorstep banking services, at nominal charges. Payment banks restrict activities to acceptance of demand deposits, remittance services, Internet banking and other specified services but cannot undertake lending services. A payment bank can accept only savings and current deposits of up to Rs 1 lakh per customer. They can issue ATM or debit cards but not credit cards. They can distribute non-risk sharing simple financial products like mutual funds and insurance products. The third type of savings account that can be opened in IPPB is the digital savings account that can be opened from the IPPB Mobile App available on Android phone. Anyone above the age of 18 years, having Aadhaar and PAN card, can open this account. The total cumulative deposit permissible in the account is Rs 2 lakh a year. For unlimited access, one needs to undergo full KYC using biometric based Aadhaar verification to upgrade the digital savings account to regular savings account within 1 year by visiting an IPPB access point. One can make instant fund transfer through IMPS and also make bill payments and recharges through this digital savings account. There will not be any QR card in case of this account.